Pumpkins are popular vegetables that seem to pop up everywhere this time of year! Pumpkins began to make an appearance in your lattes and muffins last month, and now they continue to invade your pies and soups - Yummy, yet BORING! It’s time to take the pumpkin to a whole new level! In honor of National Pasta Day (this Wednesday, October 17th), the folks at Omega Juicers have provided a few “not-so-ordinary” pumpkin recipe for you to try at home. The Omega Nutrition Center not only creates delicious fruit and vegetable juices, but it is also capable of making a variety of foods including nut butters, salsas, baby food, and pasta! 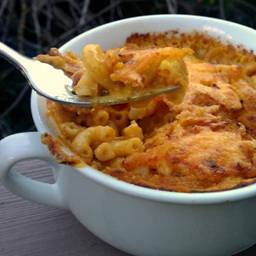 Celebrate National Pasta Day AND pumpkin eating season with Pumpkin Mac and Cheese. 2. Cook pasta in boiling salted water until al dente. Drain and rinse with cold water. Set aside. 3. In a heavy saucepot over medium high heat, melt the butter and add the flour. Whisk together and cook for thirty seconds. Add 2 cups milk, minced rosemary, and thyme and whisk until smooth. Add another cup of the milk (reserving one cup) and continue to whisk. Cook for approximately 5 minutes while whisking. The mixture will begin to get very thick! 4. Add the cheese and stir well so that the cheese melts evenly. Add the salt, pepper and cayenne followed by the additional cup of milk and the pumpkin puree. 5. Once everything is smooth, add the cooked macaroni and toss to coat. Pour into a 9x13 casserole pan and top with breadcrumbs. 6. Bake for 25 minutes until golden brown and bubbling.